In Collier County, near Naples, residents on one end of the 300-home park returned to their homes to find their homes standing, the power on, and the expected debris everywhere. In other areas of the park, roofs were blown off, blinds tattered, and debris hung from the ceiling. 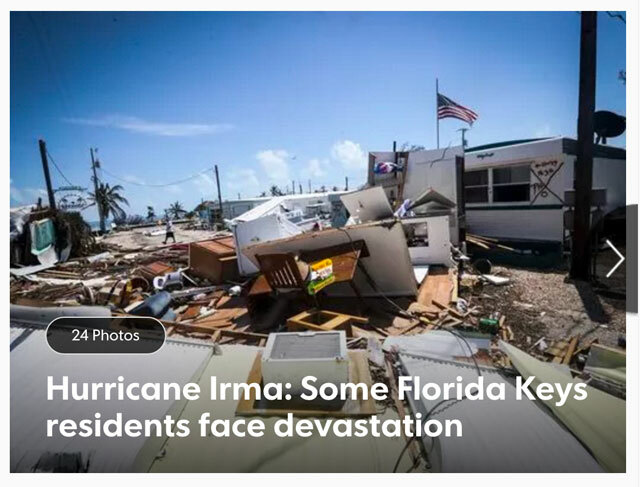 The destruction appeared to be hit and miss, which was remarkable considering that Marco Island reported a wind gust of 142 mph. All along the east coast, on the back side of the storm, the story was similar. Some homes were ripped apart while others held up in the reported 60 mph wind. In Miami-Dade County, a combination of high tide and 90-mph-wind tore roofs and siding off many of the 54,000 mobile homes there. One creative woman packed all her belongings in bags tied with bright pink bows. “If my house flies away, I will at least find my bags with bows,” she told the Miami Herald. In Key West, some mobile homes are simply gone, identified only by their concrete pad. When residents were allowed to return home on Wednesday after the storm, residents of Quinn’s Sea Breeze RV Park found nothing but wreckage and began the search for anything they could identify as theirs. Most of the homes were damaged beyond repair. Click for a slideshow of the damage at Quinn’s Sea Breeze. At Floridays, here in Martin County, we are counting our blessings.